This 8 1/2-pounder highlighted David Walker's day-best 47-06 haul. The action on the second day of the MLF Bass Pro Tour stop in Raleigh, N.C. wasn't quite as hot as the previous day. 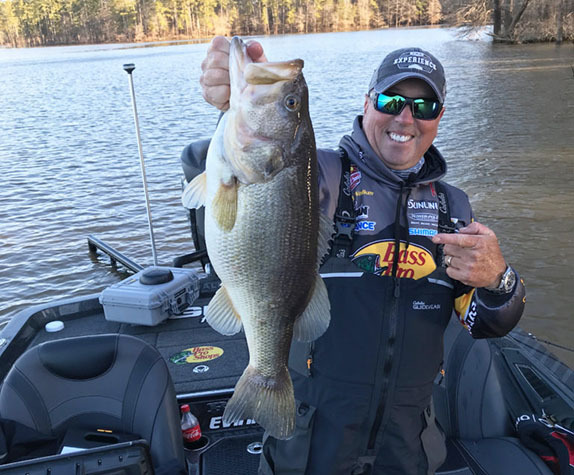 None of the anglers in the Group B portion of the Shotgun Round remotely approached the 82-04 that Kelly Jordon caught on Tuesday at Lake Jordan � none even reached the 50-pound mark, which was surpassed by five competitors in Group A. Nonetheless, a lot of big fish were caught despite the post-frontal conditions and continually falling water level. David Walker landed the biggest individual specimen � an 8-06 hawg � and also topped the 40-angler field with a 47-06 total on 15 fish. "I'd be lying if I said I knew that was going to happen," Walker said. "I only got four or five bites on my practice day here, but all of them were 4 pounds or better. I was a little bit confused and I thought I probably wasn't fishing the right way to do well in this thing because I wasn't getting enough bites, but I didn't find anything else. "This morning I cruised around a little bit, trying to figure out where I should start. I just picked a bank to go down and it was the right choice." 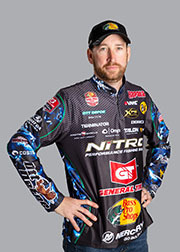 Ott DeFoe, competing for the first time since winning the Bassmaster Classic nine days earlier, was second with a 44-01 total on 13 fish. Former Classic champ Casey Ashley was next with a 16-fish, 42-08 haul, followed by Brett Hite with 42-00 (17 fish). Ish Monroe had a huge morning and led for most of the day, but managed just one keeper over the second and third periods combined and slid to 5th with 40-01 on 10 fish. There's a big drop from Monroe down to 6th-place Takahiro Omori (11 fish, 32-03). The 7th through 10th positions were filled by Dustin Connell (8, 30-15), Stephen Browning (10, 30-00), Keith Poche (12, 27-07) and Bradley Roy (6, 26-05). The action now shifts to Falls Lake, which will host the Elimination Round for both groups over the next two days, followed by Saturday's Knockout Round. The Championship Round will take place Sunday on Lake Shearon Harris. Walker caught eight fish on a spinnerbait, six on a jig and one on a bladed jig. He had nine fish before 9 o'clock, including the 8-06 that inhaled a spinnerbait at 8:30. That bruiser was backed up by a 4-14 and a 4-02. "I really didn't know what I needed to be doing, but I went down that bank and they just started biting for me," he said. "That gets you motivated and keeps you confident and I was paying attention to where they were coming from, and every time I'd hit another place like that I'd catch one." The latter part of the day was slower, but he opted to stay in the same creek arm all day. "If I'd taken off running somewhere else it would've been a total guess. A lot of times, leaving fish to find fish can really haunt you." DeFoe moved into the No. 2 slot by catching a 5-03 in the days closing minutes. It was his second-biggest fish of the day � he'd popped a 5-15 earlier. His first two fish came on a bladed jig and the rest were enticed by pitching and flipping a conventional jig. "I only had four bites the day I practiced here and three were in one area," he said. "That's where I caught them today. "I started the day somewhere else because I didn't feel like I should put a lot of stock in that one area � I really didn't expect much out of it. I thought it might be good for four or five bites." Ott DeFoe jumped to 2nd on the standings sheet by catching a 5-pounder in the closing minutes. Once he relocated, he caught a 3 1/2-pounder on his second pitch. His next fish was the 5-15. "I was just pitching to the little rock outcroppings on the bank. We catch them back home (in Tennessee) with jigs on rock on these kind of bluebird, post-frontal days." Ashley wanted to compile as much weight as he could from Jordan because his practice day at Falls was terrible. He caught 13 fish on a spinnerbait, two on a jig and one on a swimbait and his biggest, which weighed 5-02, came early in the day. "There was only me and one other boat in my main area and we were just playing hopscotch on the pockets," he said. "I fished outside bushes and willow trees � any big, isolated piece of cover. "With the falling water, a lot of the fish were out front today. Some of the shallow cover that had been good got a little bit too shallow." Hite said he had an excellent practice day on Jordan and anticipated handling some bigger fish than what he caught. A 4-15 that bit with just a few minutes remaining in the final period topped his scoresheet. "I got more bites today, but the quality wasn't as good as it was in practice," he said. "But yesterday was warm and cloudy with a little breeze and those guys (in Group A) did a number on those big females. Today was super-cold in the morning and just post-frontal all day. "I was excited to catch as many as I did, but that last one, the 5-pounder, was the only female I caught today. I had three little areas that I rotated through and it would take a while to go through them � each one had three or four coves and I'd just put the trolling motor down and fish around. Where I caught the 5 at the end of the day was where I started; I went through it one time in the morning and then let it sit, and came back with about an hour left." Monroe got only two bites on his practice day at Jordan and they came from different areas. "I went to one of them first and the wind was blowing in on it and it just didn't look right," he said. "I bailed out and went to the other one, and that's where I caught all my fish." His action started right away and stayed hot for two hours as he scored on a swimbait and a variety of plastics. He had a 7-pounder and two others that registered over 5. "The water's only a foot and a half deep in there and your trolling motor kicks up mud. I was just drifting through real slow and taking my time and flipping through everything."